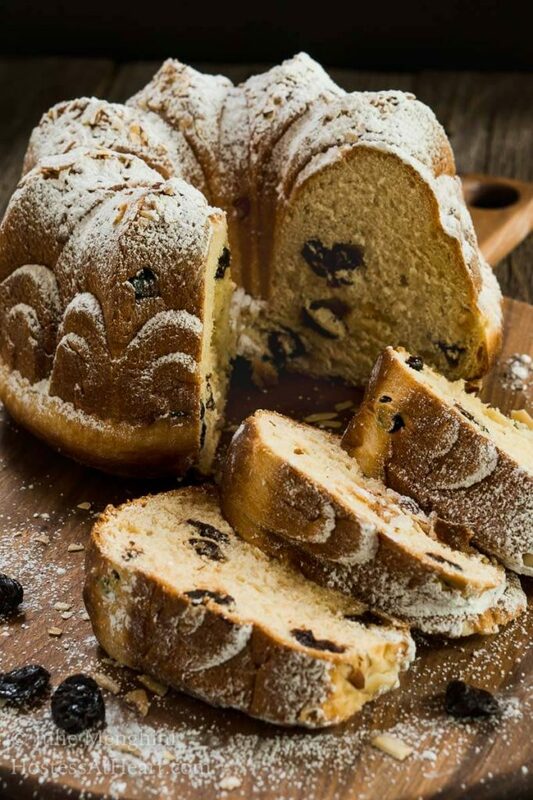 Festive Cherry Almond Kugelhopf Bread is soft and tender with a beautiful cherry aroma. While not too sweet, the tartness of the cherries pairs perfectly with the Powdered Sugar dusting. 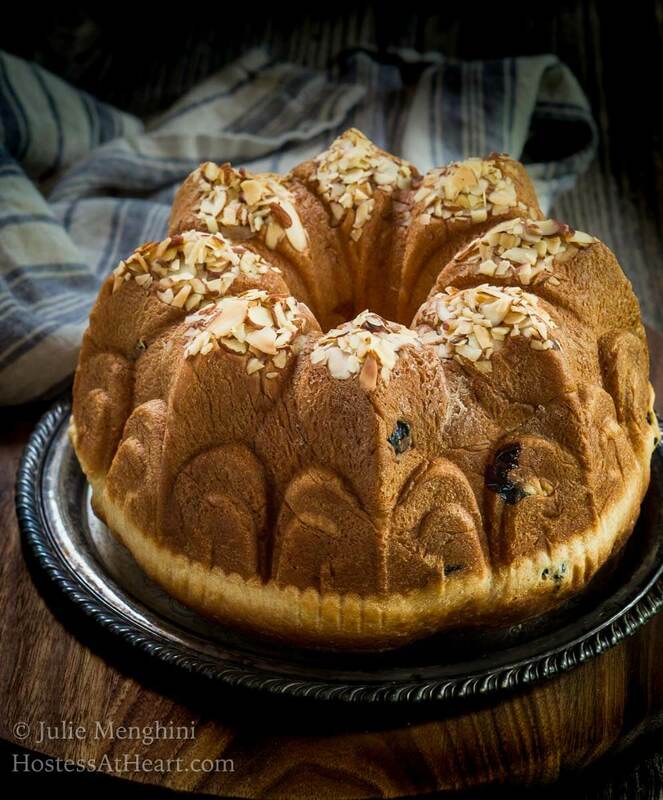 Cherry Almond Kugelhopf Bread reminds me of Spring and Mother’s Day. I think it’s because of those beautiful cherry trees that I grew up with. Cherry trees when they’re full of pink blossoms in the spring is something to behold. It’s no secret or disrespect when I say my mother didn’t love cooking. Her meals were very simple and she wasn’t much of a baker. One thing that she did do exceptionally well was to make pies. She made good use of those cherry trees in our yard and they made the best cherry pies. Especially will a dollop of vanilla ice cream! So when I made plans to try this beautiful bread together it was with thoughts of those cherries, spring and Mother’s Day. 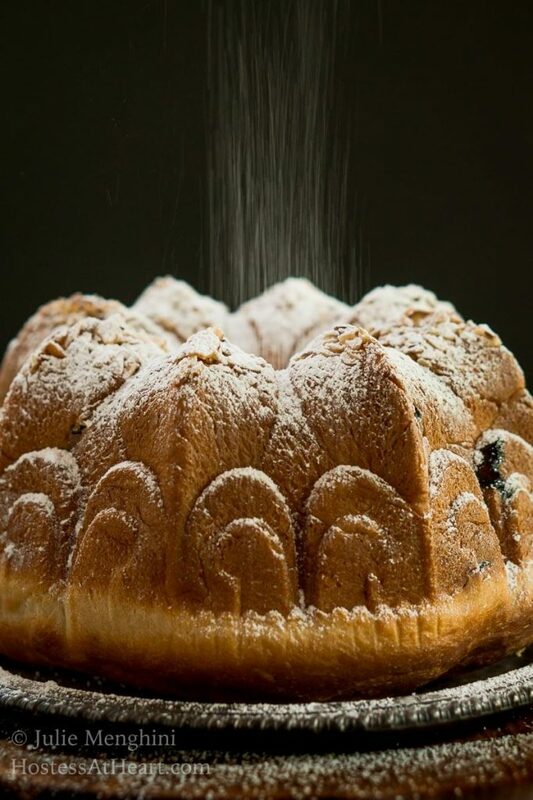 Where does Kugelhopf come from? 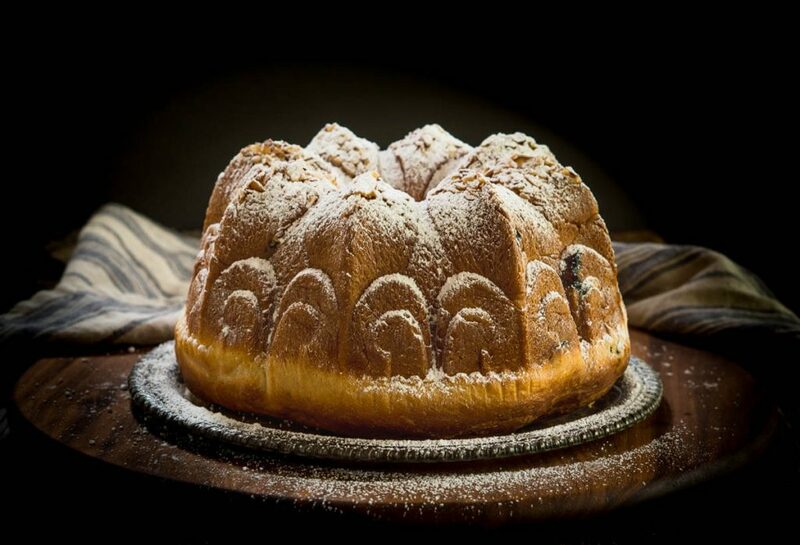 Kugelhopf Bread is said to come from Vienna. Cherries and raisins are typical of this bread in the Alsace area. John doesn’t love raisins so I went all Dried Montgomery cherries. They were so plump after a short Cherry brandy bath. They held up well in this bread. The cherry brandy is evident in the beautiful aroma of this bread. 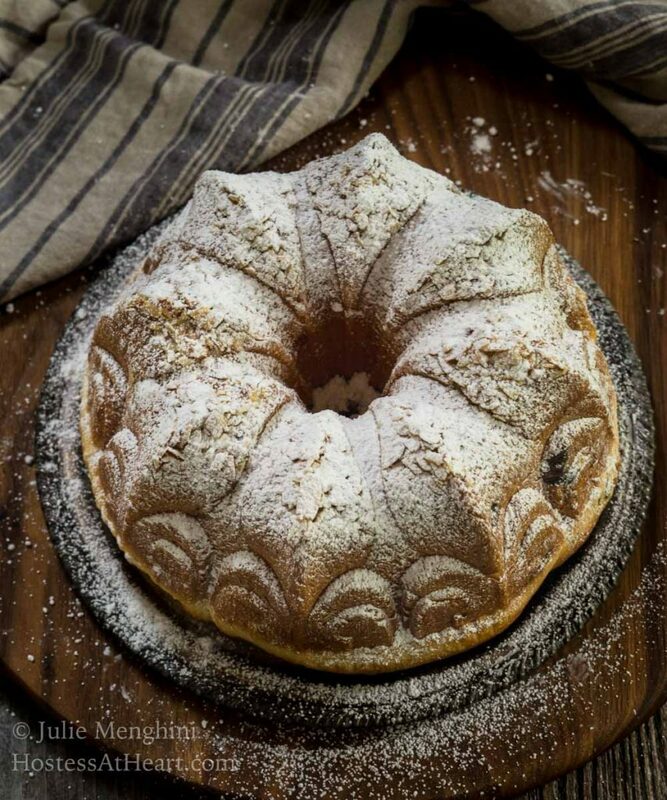 Festive Cherry Almond Kugelhopf Bread is soft and tender. It has a cherry aroma and while not sweet, the baked cherries give it a nice pop of sweet tartness. It’s recommended that an electric stand mixer is used for this bread. Microwave cherries and cherry brandy in a covered bowl for 1 minute. Set aside for 15 minutes. Drain cherries, reserving brandy. In the bowl of an electric stand mixer, whisk flour, yeast, and salt together. In a 4-cup measuring cup whisk milk, eggs, granulated sugar, and reserved brandy together until sugar has dissolved. Using the dough hook on the mixer, slowly add the milk mixture to the flour mixture. Mix until dough starts to form and no dry flour remains, about 2 minutes, scraping down the bowl as needed. Increase speed to medium-low and knead until dow pulls away from the sites of the bowl but sticks to the bottom, approximately 5 minutes. With the mixer running, add butter 1 tablespoon at a time until totally incorporated, about 4 minutes. Reduce the mixer to low, add cherries and mix until incorporated, approximately 1 minute. Place the dough in a large greased bowl, cover with plastic wrap and allow to rise for 30 minutes. Using your fingers or a dough scraper, fold the dough towards the center. Turn the bowl 90-degrees and fold again, repeat two more times. Cover with plastic wrap and let rise for 30 additional minutes. Repeat folding, cover the dough and allow the dough to rise until doubled in size, 1 to 1-1/2 hours. Grease 12 cup nonstick Bundt pan and sprinkle the bottom with almonds. Press the dough down to deflate, then transfer to a lightly floured counter. Using your hands, press dough into an 8-inch circle. Press your fingers through the center to create a 2-inch hole. Gently put the dough into the Bundt pan and lightly press into the pan. Cover and allow to rise until loaf is level, 1 to 2-1/2 hours. Preheat oven to 350°F. Bake 25 to 30 minutes or until bread registers 190°F with an instant-read thermometer. Let loaf cool in the pan for 10 minutes and then invert loaf onto a wire rack and allow to cool completely about 3 hours. Dust with powdered sugar and serve. I used a 10-cup bundt pan but a 12-cup will work as well. Recipe based on Bread Illustrated by America’s Test Kitchen. Prep time includes nonactive rise time. 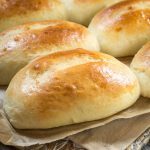 I’m hoping you agree that this is indeed a very special bread and hope that you will leave me a comment and a 5-star rating! That is such a beautiful bread and yes, it is definitely a special one 🙂 Lovely post Julie and thank you so much for hosting this month with an amazing theme. Thank you so much, Pavani! Your help with the Bread Bakers is one of the reasons it is successful and so enjoyable too! Julie the bake is simply stunning!! And yes, thanks for this theme, thoroughly enjoyed everyone’s breads. Thank you so much Smruti! I’m glad that you participated and the breads this month were simply amazing. There are so many I want to try! this bread looks fantastic! I wish I had a piece right now. The only thing I can’t decide, it should I have it with coffee? Tea? Hot chocolate? Thank you so much, Jeff! It really came out delicious. We gave some away and it’s a good thing because we liked it just a bit too much. Lovely shaped bread……..Addition of tart cherry must give unique taste to this bread….. Thank you, Sharanya! The cherries were so good in this bread. This bread looks so amazing and love the addition of cherry and almonds. Thank you Sneha! We really enjoyed it too. Perfect for breakfast or tea. Oh heavens, Kath I left out so many details on this recipe. Thank you for bringing it to my attention! This was baked at 350°F for 25 minutes and I’ll be correcting the recipe right away. Thank you for that correction but now the full instrctions are there-5 hours to bake bread…..it maybe a while before I make it even though I have the Bundt tin you made it in. There is a lot of raising steps with this bread Kath. 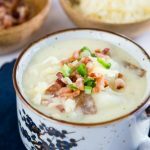 It’s perfect for when you’re going to be home all morning or afternoon. I believe that you could use an angel food pan too. Thanks again for bringing the lack of instructions to my attention. I must have been sleeping on the job LOL! Gorgeous flavors and presentation Julie. I am always in awe when you post your special breads for your bread makers group. This looks positively stunning, great job! Thank you, Loretta! This was such a special bread and I was so happy with the way it turned out. This is much too pretty to eat. Good thing I can’t smell that aroma! Great lighting. Thank you so much, Patti! I love the smell of baking bread! I had a bit of fun with that photo shoot. 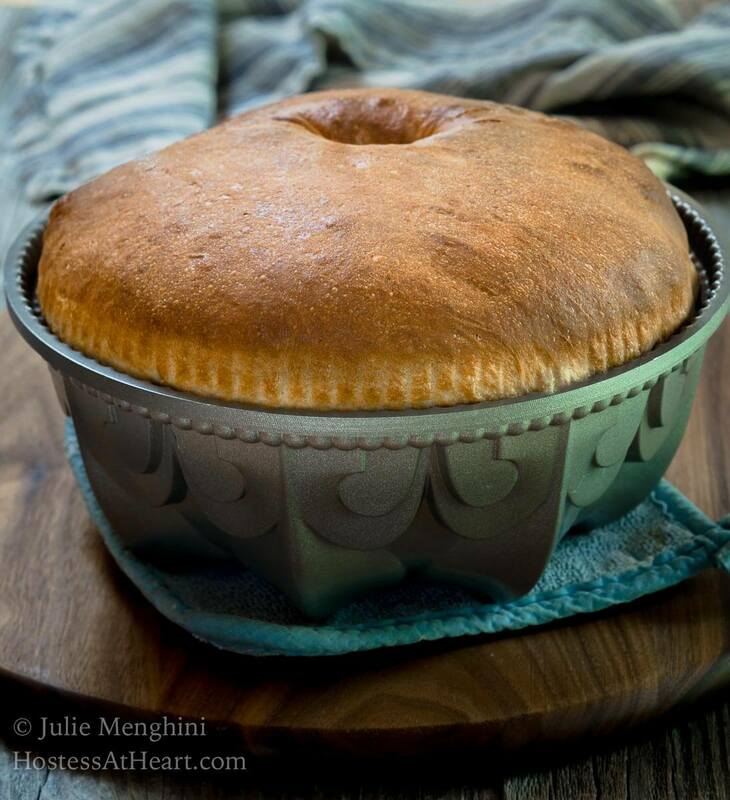 I’ve baked a kugelhopf and its an amazingly soft flavourful bake. You’ve used cherries and almonds which must have made the bread taste so delicious.I love your bundt pan… beautiful bread. Thank you, Mayuri! You are so sweet. It’s the first time I made this bread and it reminded me a bit of a brioche. I loved the cherries in there too and love being able to use my bundt pan for it too. What a gorgeous treat, Julie. I adore sour cherries both fresh and dried. (I planted a cherry tree in my yard just so I could make fresh cherry pies.) Almond and cherries are naturals together. 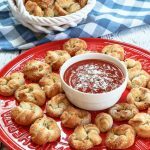 This would be the perfect mother’s day brunch treat! Thank you so much, Eileen! I’m so envious that you have a cherry tree! They indeed make the best pies! Thank you so much, Namita! It was a fun theme for me and I appreciate everyone’s patience with my hosting LOL! There are indeed some amazing bread every month. The talent is amazing. Thank you so much, Anne! I just love this time of year and everyone did an amazing job baking for the theme! Just stunning. and I reminded me that I purchased a pretty bundt pan a few years ago and it’s still in the box!!! Thank you so much, Mimi! It was a unique bread for me and I had a lot of fun putting it together! That’s sort of “queen for a day” bread! It’s stunning, and I love tart cherries. Thanks so much for hosting this month! Thank you, Karen! I don’t know if I was on the ball with hosting but it was fun trying. The cherries in this bread were so good and it was big enough to share. That is one gorgeous loaf of bread and I love combining cherry and almond flavors. Thank you, Wendy! It is obe of my favorite combos too! Very nice Julie! I love the design of that pan. Thank you, Jess! I found that pan in the box in my mother’s basement. she didn’t even know it was down there and I really enjoy it too. What a gorgeous bread Julie! I love that you made a bread that reminded you of your mother and her cherry pies. It looks delicious! 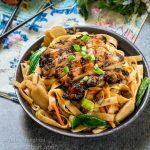 This looks so good and I love all the flavors in this recipe. The pics are wonderful. Pinned and shared! Thank you so much, Quinn! I really appreciate your photo comments and sharing! Julie that bread is spectacular,, one of lifes great pleasures is homemade bread and this one looks positively regal. Beautifully done and so so special. Thank you Suzanne! It was so good and we had plenty to share. I agree that there is something amazing and humbling about homemade bread.